Uniterah is an online platform that brings communities together through common interests and lifestyles. 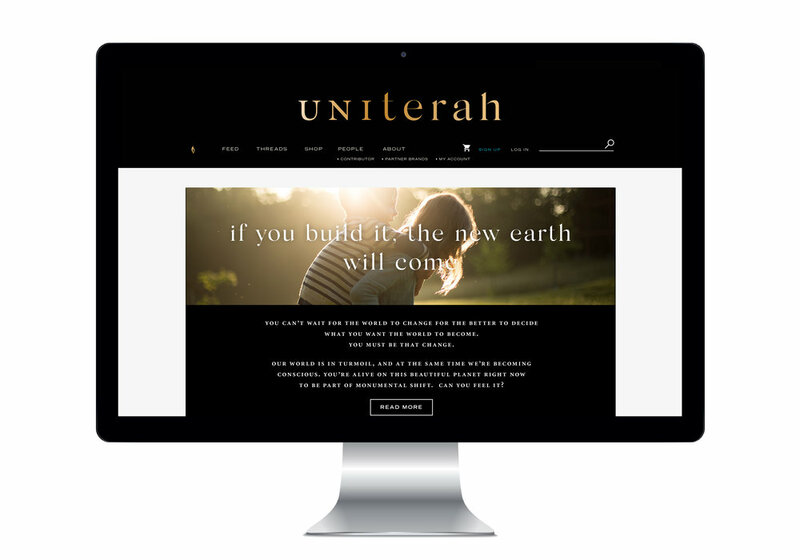 Lead by spiritual leaders throughout the world, Uniterah is open and available for everyone and anyone that wants to connect and explore on a spiritual level. We wanted to promote special aspects of the brand, such as their innovative, holistic and humanistic values. In the logo we highlighted the word “Uni” in all upper-case, meaning one, as their core brand message. The flame that appears within the U symbolizes the flame that lives inside all of us, and is used as an iconic element throughout. The typography style harmonizes sharp modern edges with wispy tails that appear in each lower case letter. Black and gold create a rich and dramatic presence online, with colorful photography set in jewel tones. Their new brand identity represents the modern spiritual community, through modernity and beauty. Uniterah is here to create common ground within all individuals, by celebrating wellness in any form.